We have assembled answers to the questions most frequently asked about our fellowship and about Unitarian Universalism. Please feel free to ask your own questions of any members before or after worship services or by calling the office. Do you folks believe in God? Some of us do and some of us don’t. We support each person’s path to their spirituality. God is viewed differently by many people. Some believe in a personal God, others in a spirit who sets in motion the laws of the universe. God is unknowable, a mystery. Many of us define God for ourselves. What do you mean by “spiritual path”? We are a community of people “walking together” (to use a phrase from our Puritan forebears) for whom the values of community and the dignity and worth of all persons are more meaningful than theological dogma. If you don’t believe in anything, why do you get together? Can you believe in ANYTHING? We get together because (1) we recognize a thirst for religious meaning, in ourselves and in each other; (2) we have not found meaningfulness in the statements of faith handed to us or urged on us by others without regard for our own ability to perceive, think and experience; and (3) we find nourishment and encouragement for our individual spiritual development/search by affirming and implementing our shared values together. Each of us develops our faith in our own ways. Respecting the individuality of religious belief is a core value of our tradition. We find that we can experience a nurturing and lively religious community by encouraging each other in our spiritual development and by affirming and implementing our shared values together. We are post-Christian. Our roots are in Christianity. But as we evolved as a religious community, our democratic principles guided us toward an ever-widening vision of inclusiveness. Today, we welcome people from all faiths. We regard Jesus as a great teacher and prophet, whose impact on our culture should be understood and respected. Many Christian values, such as “love thy neighbor,” are values that we cherish. But we do not believe in the divinity of Jesus — indeed, the decisive departure for Unitarians from Protestant Christianity was over this difference — and we do not believe in the Trinity. As a Jew, I am thrown off by the word “church.” What can I say to my friends? Our religious community emerged out of the liberal wing of Protestant Christianity. The word “church” retains our history, but we extend our welcome to all, regardless of their religious background. Many prefer the term ‘fellowship’. We sometimes debate whether we should continue to use the word “church” ourselves! I’m confused by the words “liberal religion” — does this mean Republicans aren’t welcome? No. The term “liberal religion” refers to those traditions that are open to new insights, to learning, and to change. We belong to the tradition of “free thinkers” who value the potential of human nature and the validity of personal discovery. Used in this way, the word “liberal” is a way of identifying our faith, not our politics. Members in our congregation belong to various political parties. We share many values. Some of them are progressive social values derived from our faith in the worth and dignity of all persons. We respect the personal choices that people make in their political affiliations. No. 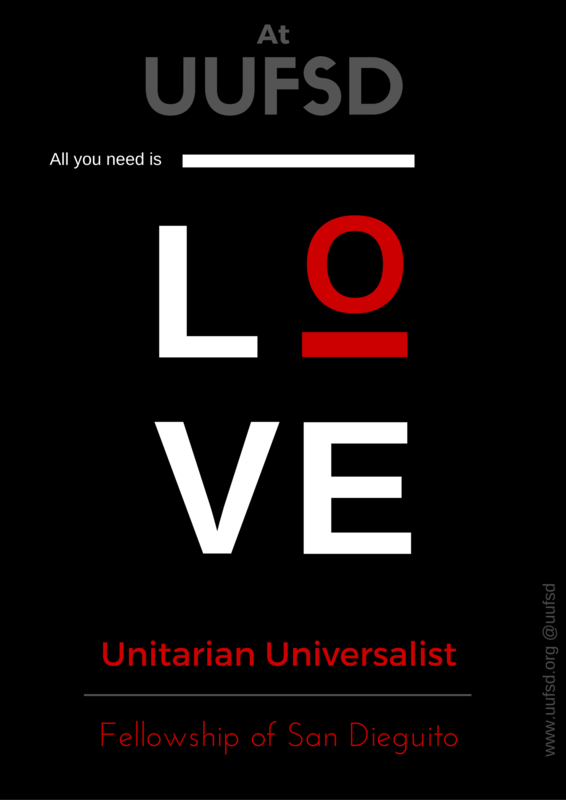 Because of our inclusive values and the independence of the individual congregation, people often don’t know that we belong to a larger organization — the Unitarian Universalist Association of Congregations in North America (UUA). This is not a denomination, but a member association. The UUA provides a central office for the support of local congregations, and as a community we do have a common identity and purpose. What do you mean by “worship”? To worship is to “give value” to something. In our faith, to worship is to join together to celebrate our lives, our values and our hopes. It is a time for learning, growing and making real our caring for each other. Although we might not all agree that we worship “God” during this time, we approach our worship with reverence. What kind of texts do you use in the service? We use a variety of texts for our service. To understand the full range of our worship, we suggest you visit more than once, because we use a different text each week. Why aren’t there prayers in the service? We usually set aside time for meditation to reflect in silence on brief spoken words. We believe that prayer is individual. Some people pray during this time; others meditate. What do UUs believe about abortion? We believe in choice. It’s a private decision. Our larger community has consistently supported the right of a woman to choose: it is a personal and spiritual decision. How does this church feel about bi-sexual, gay, lesbian, and trans-gender people? Our community is a Welcoming Congregation. We welcome all persons regardless of sexual orientation. Bisexual, gay, lesbian, and trans-gender people and their families are important members of this congregation. Commitment ceremonies have been performed by our denomination for several decades. 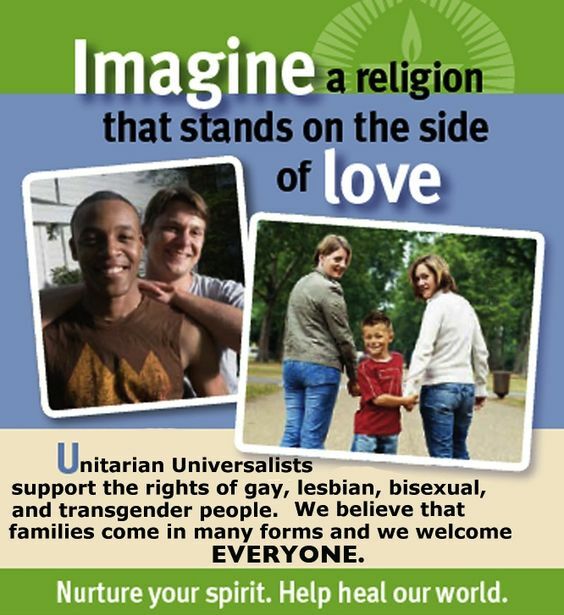 The larger UU community has consistently voted affirming bisexual, gay, lesbian, and trans-gender rights. What do you mean by “inclusive church” and “worth and dignity”? We are an inclusive Fellowship because we welcome anyone who feels that they belong here with us. Our Purposes and Principles state that we respect the worth and dignity of all people and our goal is to belong to a community that models that affirmation. Is this a family church? Yes! We have a vibrant Religious Education (RE) program at UUFSD. Our RE Director Alison McLeod is available for questions on Sundays after service or via email, alison@uufsd.org. 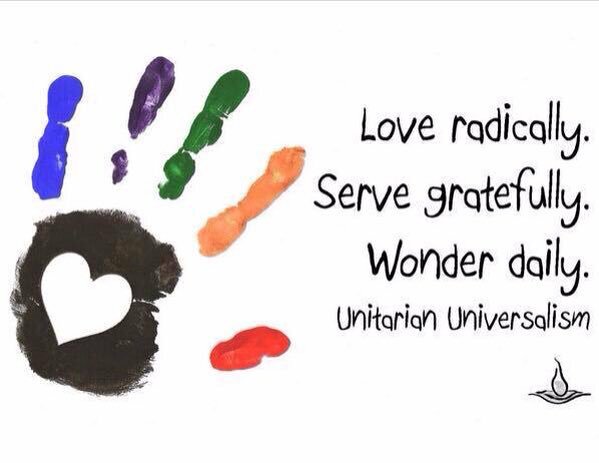 We use UUA materials developed by religious educators. Throughout the year, we have inter-generational worship services and activities. The children’s story each week is related to the sermon topic of the day. We offer childcare at many of our programs and we have a complete children’s religious education program graded from pre-school through high school. We offer Our Whole Lives (OWL) programs as well. What is your Sunday School about? What goes on? To what are the children exposed? We offer religious education for children and many programs for adults. Our children’s program uses age-appropriate curricula to introduce children to basic ethical values, world religious traditions, Unitarian Universalist history, and personal spirituality. We also offer an intergenerational community to people who want a supportive environment in which to raise their children. Is this an interfaith community? 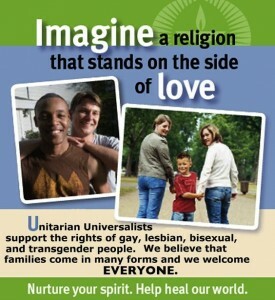 A Unitarian Universalist approach to religious identity honors the backgrounds of all individuals. It affirms the decisions to belong to this community, where difference is celebrated and people can share their Unitarian Universalism as a family. In many families, parents have different faith backgrounds. Children here learn about the major world religions, understand the meaning of the various holidays, and celebrate them together in the religious education program and in our worship services. What do you tell children about God? We try to introduce ideas at a developmentally appropriate age. A lot of children do believe in God at an early age, and that’s okay. If they don’t, that’s okay, too. What do you say to children about Jesus? We teach that Jesus was a Jewish teacher and prophet whose life offers many lessons to those who study it. How do I meet people in your fellowship? What activities do you have? We have a wide variety of groups, committees and activities within our fellowship. Ask a greeter or Board member for more information when you visit on Sunday. Check out our Fellowship, News &amp Events, and Education sections of this website for more information. For more information, contact the office at office@uufsd.org for more information. We’d love to hear from you! I still have questions — where can I go for more information?